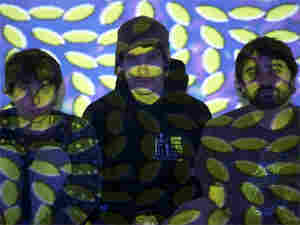 Animal Collective: The Electronic Turns Organic Animal Collective is an experimental pop band that's cultivated an air of mystery over the past few years, as well as a passionate following. Will Hermes reviews the band's new album, Merriweather Post Pavilion. Animal Collective is an experimental pop band that's cultivated an air of mystery over the past few years, as well as a passionate following. The band's music is difficult to categorize: the trio uses drones, loops, sound collages and unusual vocal harmonies. One of the things I love most about Animal Collective is how hard it is to pin the music down. I guess it's a rock band. But nothing ever sounds as simple as a singer with guitar, bass and drums. Instead, by using electronics to process natural sounds and generate unnatural ones, they create fantastic spaces where voices dart like dragonflies, and sound-fields roll through like fog or thunderstorms. What keeps me coming back to Animal Collective's latest album, Merriweather Post Pavilion, is how the band uses electronic gadgets and otherworldly sounds to make music that feels strangely organic. Take "Summertime Clothes," for instance, which captures the palpable delirium of a heat wave and, maybe, the fizzy joy of love. It's a new thing for Animal Collective songs, which are always emotionally hypnotic, to also be intelligible. That's one of the refinements on their new record, along with some startlingly sticky melodies. As in the past, you hear traces of electronic dance music in the repetitive beats and loops. But the group's curious vocal arrangements are more straightforward than ever here. They may actually remind you of The Beach Boys if Brian Wilson had gone down a more psychedelic road after Pet Sounds. Animal Collective is one of a few current bands, including Fleet Foxes and TV on the Radio, that is rediscovering the power of vocal harmony. And it's interesting that the group named its record, Merriweather Post Pavilion, after the Frank Gehry-designed performance arena in Maryland. I doubt it's because the Animal Collective aspires to be an arena-rock band — though it's already played major festivals, and fans are starting to follow its tours and record the shows like Grateful Dead fans used to do. Instead, I think the record is more about the arena inside a person — that huge space that contains multitudes. And to me, this record is the sound of those multitudes rushing out.